You can always think positive of your creations with respect to mobile applications. The end customers can have a different opinion. You can only have a strong feedback by publishing your app into the app store. Hence, it becomes really difficult to predict the future of your app until and unless it is properly published. Mobile app development services has gained immense popularity owing to the huge demand of smartphones devices. The main focus of a mobile app development company is to create apps that are flexible or compatible on various OS and which can serve the desired purpose of the end users. Deciding on Free or Paid App: The app monetization policy is a prime aspect which you need to figure out prior to its publishing. You need to emphasize whether you will make your app free or paid. If you go for pricing then you also have to fix up a pricing model. To make your app worthy of being paid you need to assess its due features. If you want your app to be attractive for the customers it is advisable that you can go for premium model. But if your app is dedicated for delivering painstaking services like medical consultation, then you can go for subscription based app. You must be knowing that the renowned gaming apps are also not free, so its your call totally to decide the growth path. 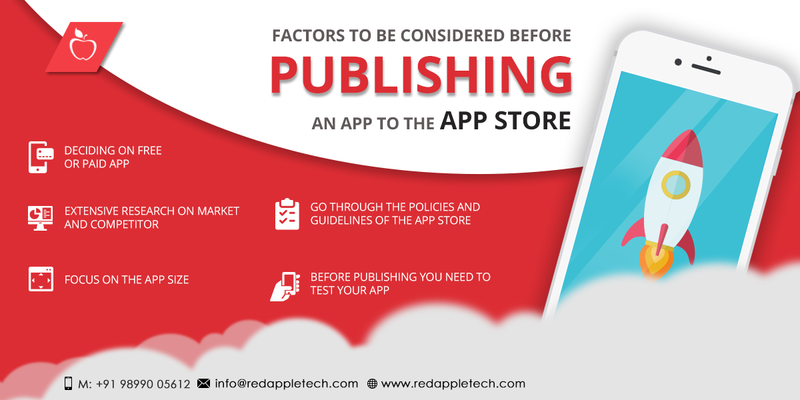 Go Through the Policies and Guidelines of the App Store: In case of iOS there are plenty of reasons that can result in the rejection of the apps. It actually has got a stringent policy with respect to app publication. If you miss any minute detail then there are definite chances that you can fail to publish your app. Similarly Google Play Store has also its own set of rules and regulations stated in its official blog page. You need to pay full attention so that you do not miss the bus. Extensive Research on Market and Competitor: This is the most vital and the most time consuming vertical. But you cannot afford to miss this. You have to assess the trends that your probable competitors are following while planning to launch. This will further contribute in knowing the features that are mostly sought after. Before Publishing you Need to Test your App: You must have to test your apps before publishing it into the app store. You apps have to meet the expectations and basic requirements with respect to the concerned operating system. All quality checks have to be passed easily without encountering any errors. The aspects of UI and UX should not be comprised and the graphics have to be flawless. The contents of the apps should be crisp and to the point. It should also attract the customers along with satisfying their purpose. Focus on the App Size: You need to make the size of your app compact so that it does not consume huge time of the users. It may happen that the users can opt out if it takes hell lot of time to get installed. In other words you have to work to reduce the size of APK which contains the classes, resources and files of your apps. It may happen that you are not getting the desired response as expected after your apps get published in the app store. Then you can realize that something is seriously wrong with your app and hence it is lagging behind. Hence it is advisable that you need to pay heed to the above mentioned steps so that your apps can stay ahead in this competitive world.